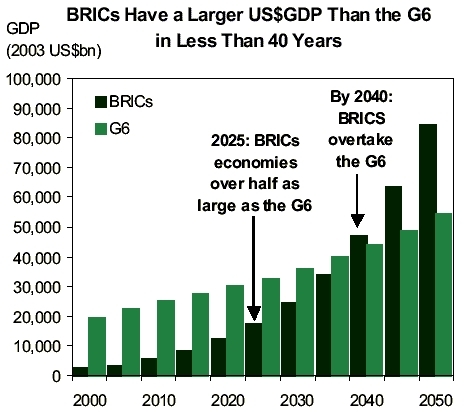 Did you know that BRICs economies could become a much larger force in the world economy by 2050? BRIC or BRICs are the acronym used to refer to the combination of the four biggest emerging-market countries: Brazil, Russia, India and China. In 2003 Goldman Sachs (a leading global investment management firm) came up with a research report called “Dreaming with BRICs: The Path to 2050”. According to Wikipedia BRIC (Brazil, Russia, India, and China) is a coalition of regional and superpowers reportedly proposed by Russian President Vladimir Putin. Many mutual fund companies have come up with a type of fund called The BRIC funds, which invest primarily in the BRIC countries. Huge market and cheap labor force matters. hey i think we all should start investing in China and India!! brasil, russia, india e china certamente seram as maiores potencias mundias em 2050, pois o brasil e a china estão em alto crescimento economico social!!! 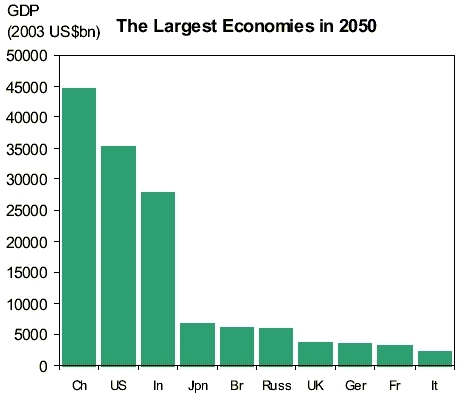 I’M brazilian, i think brazil will be 5° economy in 2025, 4° 2050. Nitin………..,we really dont need to worry,but what about the poor people in India,thier number has been rising in India. India may be 2nd or 3rd largest economy in the world by 2050, but at the same time I think India is also going to have the largest number of poor as we have today…….. Dont you think so? it’s absolutely true that india will b one of d most powerful economy by 2050.but we see dat poverty nd troublesome conditions among ppl is increasing day by day.our pm said dat income is also incr. But dis don’t suit 4 poor ppl.if india really wants to get d peak of success den system will hav 2 muv wid dos ppl too bt not blindlessly. Really appreciate the economic contributions and potentials of the BRICs but what are the effort of the BRICS to ensure that country like Nigeria with her population and mineral deposit become part of the World largest economy by 2050? Next post: Bull and Bear Markets…..what are they? Previous post: Pretty lady …Vidya Balan can’t cook!